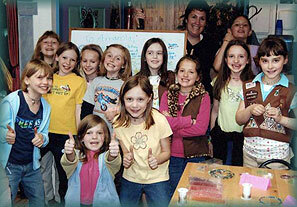 We pride ourselves on our top notch classes & instructors! We know it takes more than a great design to create a great class! We hire only the BEST teachers from the local area and beyond. Classes are open to all levels of experience unless noted. We do not limit the age of our students. If you like the project and think you can learn to do it with our guidance then please join us! Keep in mind the size of the beads in the project and don’t forget your glasses if you need them for close work! Our classroom space is comfortable and brightly lit with OTT lights in the overhead fixtures! For full day classes, we have a refrigerator and microwave for student use and a host of cafes within a few block range of the shop. Fee with (*) denotes that supplies are included. Stop in our store or call (262.634.6088) to register. Join in the fun the first Tuesday of every month from 6-9pm. It’s an evening of creativity, laughter and everything in between. 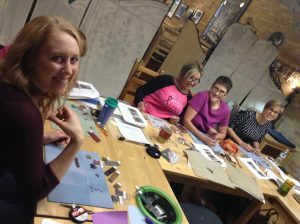 Bring your latest project and have fun beading in our studio space. No reservations necessary… we always have room for whoever comes! The store is open for shopping until 9pm. This time has been reserved for a birthday party! 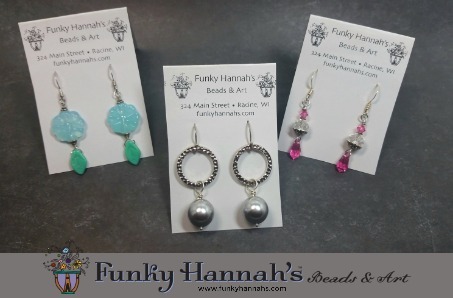 Kids age 7 and older LOVE birthday parties at Funky Hannah’s… who wouldn’t? 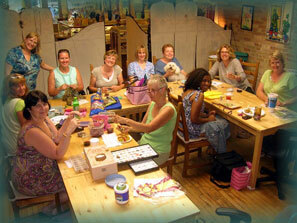 A roomful of colorful sparkly beads at your fingertips to create your own matching necklace & bracelet set. We take care of all the set up, clean up & instruction. All you have to do is invite your friends and show up! You are welcome to have the whole party here–cake & presents too! Just let us know when you book your date! Parties last 1.5 – 2 hours. Cost is $14 per guest, with a minimum of 8 kids or $112 for a party. Maximum party size 12 (or so). They are popular & space is limited so please make arrangements well in advance! A deposit of $56 is due at the time of reservation. At the request of many, this fun and fancy ‘cocktail’ ring makes its class debut! 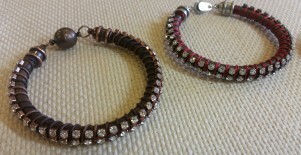 Using 15’s and delicas, you’ll net around a Swarovski crystal stone and create a band using right angle weave. Itsy bitsy 2mm round crystals add the final bling! 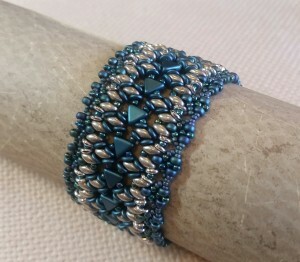 With all the hot new superduo colors, the possibilities for this new design from Ella D are endless! Which colors will you choose?! 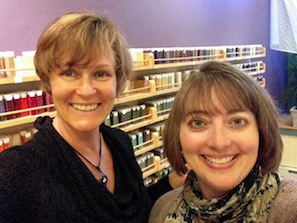 This class is a great one for beginning stitchers! Wade in to the shallow end of the beading pool and we’ll have you swimming in no time! Join Funky Amanda for this new class! 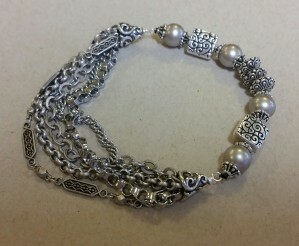 Designer Erika Sandor has graciously allowed us to teach this in the shop! 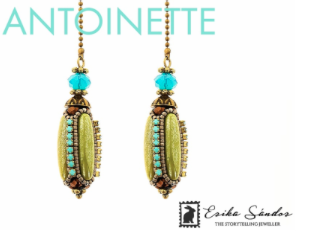 We’ll purchase & print the pattern for you and show you all our tricks for creating this stunning earrings! 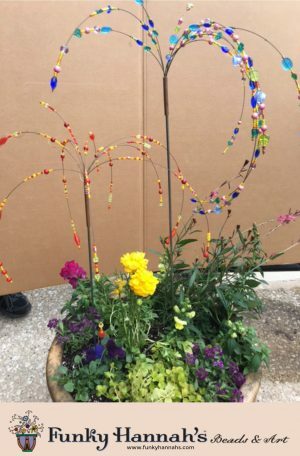 You won’t want to miss the chance to learn how to make this and hang out with us! Italian designer Ellad2 has graciously given permission to teach her to-die-for original designs! The Aster Pendant is gorgeous and reminds us of this beautiful fall flower. With a 14mm Swarovski rivoli center, it incorporates Superduo beads, plus crystals, pearls and seed beads. We can’t wait to share this new design with you! A cabochon from the Middle French caboche (head), is a gemstone which has been shaped and polished as opposed to faceted. The resulting form is usually a convex top with a flat bottom. 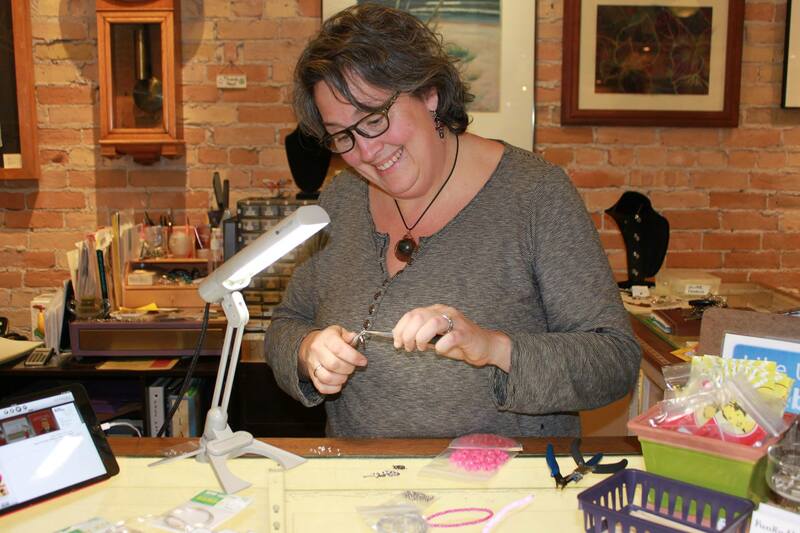 Joellen Fritchen will be sharing her tips and tricks in this fun and creative class A cabochon, or ‘cab’, has no hole so how does one use it??? 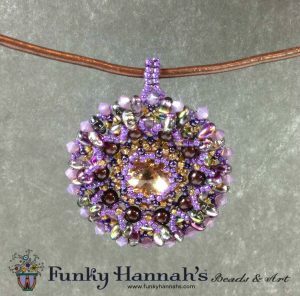 In this class you’ll learn how to bezel, or frame, your cab with beads – seed beads, bugles, squares, and more so it can be used as a pendant or incorporated into a bracelet. Buttons work well also. 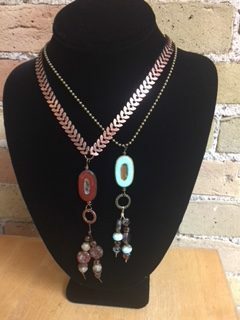 Once you learn the basic techniques the possibilities are endless for creating knock out jewelry using cabochons! 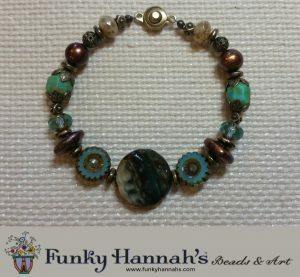 Watch for our Beaded Copper Cuff class for incorporating your cab into a great bracelet cuff! 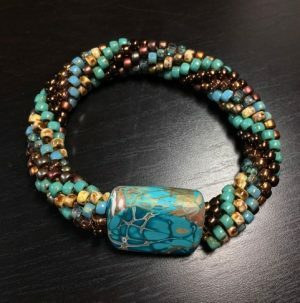 Turn a copper blank with a colorful patina into a great cuff edged with seed beads in your favorite colors. 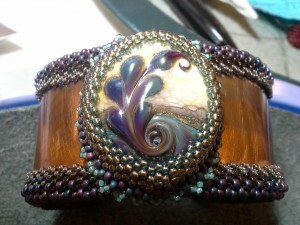 Take our cabochon class, or work one up on your own if you’d like to create a focal embellishment on the cuff. 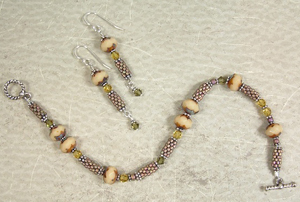 Learn the basics of bead crochet in this class with our pal Candy Sexton! 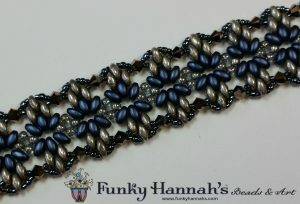 Students will use a focal bead and 3-5 colors of 6º seed beads to create a fun and unique piece. 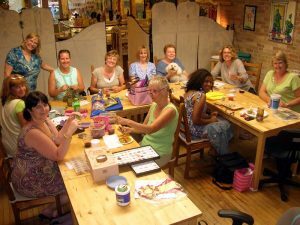 Bead crochet can be tricky to learn on your own….in this class you can learn from a pro! Candy has written several books on Bead Crochet and is a sought after instructor at bead shows and shops around the country. Join us for a fun afternoon learning something new with Candy! 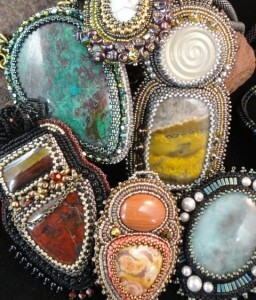 Join our pal Joellen Fritchen as she teaches us how to add some swingin’ interest to our cabochon pieces! This is a two day class, held on two Tuesday evenings in July. Part One of this project. 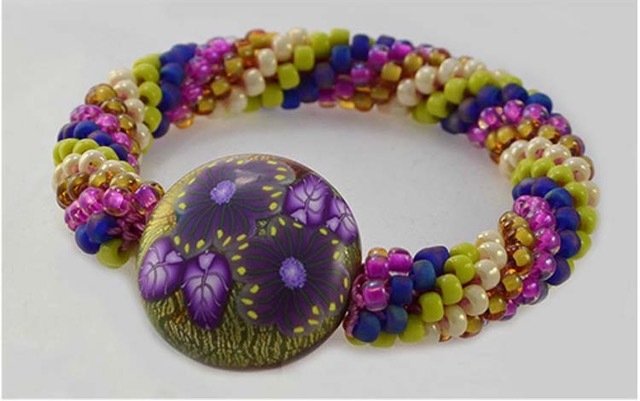 Learn the tricks of creating a perfect bead embroidered cabochon. 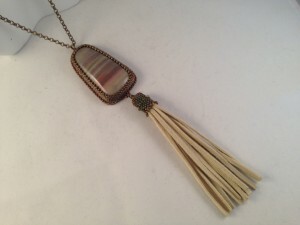 Part Two: Put together a tassel to add some swingin’ interest to your bead embroidered cabochon. One of several debut classes for Spring 2016! The Calista Bracelet, from the prolific Ella D, features Khoeps, Superduos, O Beads and seed beads for a wide but lacy bracelet. 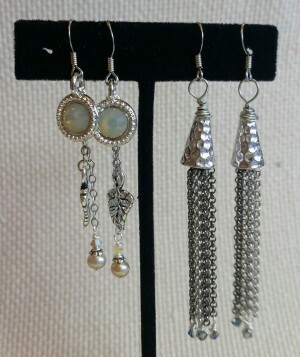 Make two fun pairs of earrings in this new class. 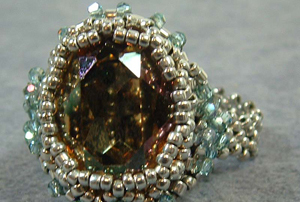 Learn some wireworking basics and use some fun metal components to design these beauties.